Bradford has been an established brand in Dubai since 1998; we were one of the first MBA programmes to establish a presence in the country. We are a Triple Crown Accredited School, part of an elite group of universities that has accreditations from AMBA, AACSB and EQUIS - this means your qualification will be recognised throughout the world. We have also accreditation from the KHDA (Knowledge and Human Development Authority) in Dubai. The programme will provide you with the strategic, financial and people skills you’ll need to progress and perform effectively at senior levels. The programme combines management theory with real business application. From day one you’ll be able to apply new knowledge and skills to your workplace. You will develop a broad foundation of knowledge in core modules, and focus your studies around a particular sector or discipline in elective modules. Our state-of-the-art facilities are located in Dubai Knowledge Park. The flexibility of our MBA gives you options to study in Bradford, Toulouse (one module) and online through Distance Learning. All modes use the same platform but deliver it in different ways to maximise the impact. This provides you with excellent and lasting networking opportunities both during and after your MBA. Our Executive weekend teaching format provides you with a period of concentrated study that has minimal impact on your career. If you are unable to make a weekend you can study the module online, anywhere in the world. Our refreshed MBA has been designed with your future employability in mind and we continue to work with major employers on our MBA Advisory Board and International Advisory Board to ensure our syllabus deals with contemporary issues. Our School of Management MBA courses have been endorsed by the NHS Leadership Academy to deliver the NHS Master's in Business Administration (MBA) programme, as announced in a speech by the Secretary of State in 2016. All applications are considered on their individual merits and will be assessed using a collective approach, which takes into account professional status and work experience as well as academic achievement. You should have a good first degree awarded by a UK university or overseas equivalent, or a relevant professional qualification. If you do not have a first degree or professional qualifications you will need to demonstrate significant management or business leadership experience (normally eight years). We will also consider an academic recommendation based on the interview. We will require evidence of numeracy and literacy competencies, and you may be required to complete an authorised online aptitude test such as the Graduate Management Admissions Test (GMAT) or School equivalent: The Bradford Test. 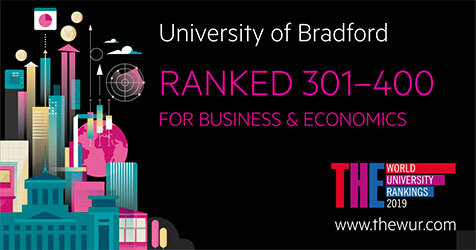 If you do not meet the IELTS requirement, you can take a University of Bradford pre-sessional English course. The flexibility of our MBA gives you options to study in Dubai, Bradford, Toulouse (one module) and online through Distance Learning. Teaching for the core is available as block teaching over Thursday, Friday and Saturday, 9:00 – 18:00. The teaching blocks are spaced at a minimum of five weeks apart, going up to nine weeks in some instances. This is to accommodate public holidays. The majority of modules are available online. This means that if you are unable to make a weekend, you can study the module online instead, thus providing you with greater flexibility. You will be automatically assessed for a scholarship as part of the application process. To be considered for a scholarship please ensure your application is submitted by 31st August. Applications for the course will stay open after this date but will not be considered for a scholarship. Travel bursaries are available for students to apply to study block electives at the Bradford campus. The bursary will be between £250-750, and will be paid to students upon proof of receipts covering the relevant travel and accommodation expenses incurred when attended the block module(s). Applications are assessed by the MBA Director of Studies and awarded on a case by case basis, application forms will be made available when students commence their studies. Additionally, if you are unavailable to come to the campus we conduct individualised online coaching sessions. An MBA is an opportunity to either change career direction or consolidate experience then return and progress in a previous industry or job. The Financial Times Global MBA rankings show that, on average, 20% of alumni achieve board-level positions within three years of graduation. On completion of the programme, participants go into a wide variety of functions and sectors, with IT/Telecoms, Finance & Banking and Industry being amongst the most popular. Students can study block modules in Bradford or Toulouse. All the material is available online. This includes a study book, lecture slides, audio and video. In addition to the face-to-face teaching, four online tutorials are available after the weekend module. These will normally be led by the lecturer who conducted the module. Additionally, we have an Effective Learning Service that will assist you in areas such as critical thinking and referencing. The material is research-led with contemporary material for current managerial and business issues. The rationale for the redesigned MBA is that it maps on to the four research centres of the School of Management.